The Documents tab provides a Search field at the top for adding search criteria such as cabinet or account, tags, text, and/or a relevant date for search criteria. Refresh: The Refresh button at far left lets you update a search after adding criteria. 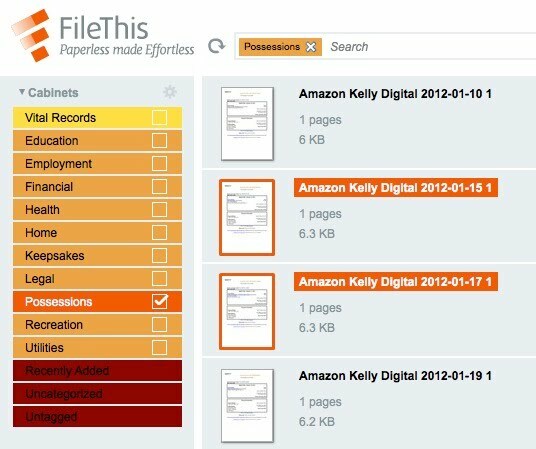 Search by Relevant Date: The Relevant Date control lets you search for documents based on the relevant date assigned by FileThis (or customized by the user). View search criteria: The field displays a “breadcrumb trail” of the search criteria you add. Delete search criteria: To remove a cabinet and tags from the search criteria, click its close box in the Search field. 1. To search all documents, click the Home button to clear the search field. 2. 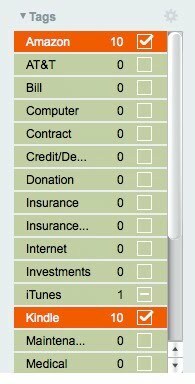 To search a specific cabinet or account, click it in the Cabinets list or Accounts list at left. (You can search a cabinet or account but not both; you can only select one cabinet or account at a time). A selected cabinet displays inside a red button in the Search field; a selected account displays inside a green button. 3. To limit the search to documents with specific tags, click those tags in the Tags list at left. The selected tags will appear inside a blue button in the Search field. If you search for Rubber Duck, you will find all documents that contain either Rubber or Duck (within the selected cabinet and tags). If you search for Rubber AND Duck (with “AND” in all uppercase), you will find all documents that contain both Rubber and Duck. If you enclose Rubber Duck in quotes, as in “Rubber Duck,” you will find all documents with that exact text string: Rubber [space] Duck. If you search for Rubber NOT Duck (with “NOT” in all uppercase), you will find all documents that contain Rubber but not Duck. 5. To use a document’s “relevant date” as search criteria, click the Date field at right. 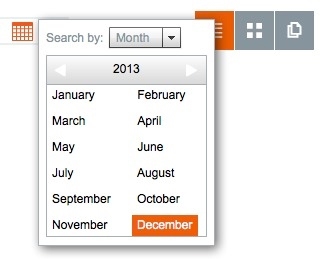 Choose Year, Month, or Day from the Search By menu. To search a range of years, months, or days, Shift+click the first and last option in the range. To search discontiguous dates, Command+click (Mac) or Ctrl+click (Windows) the options. Note: When you upload a document, FileThis reviews its contents and tries to determine a useful date—such as the date an invoice was due, a purchase was made, or a contract was signed. This is the relevant date. If FileThis cannot determine a relevant date, the document’s upload date is used. 6. As you add search criteria, click the Refresh button as necessary. Once you narrow down the search enough to find the document you may want, you can double-click it to preview and search for text in the Preview window. The search criteria above helped find all the books by Michael Connelly purchased for an Amazon Kindle. 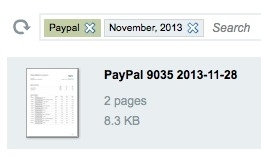 This simple search helped find a PayPal statement received in November 2013.